BUY NOW!!! 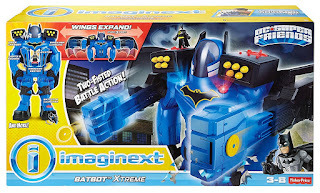 This Fisher-Price Imaginext DC Super Friends Batbot Xtreme ONLY $44.59 (Retail $109.99). Over 2 ft-tall Batbot Xtreme comes with wings, punching fists, projectile launchers, a motorcycle, &amp; a voice changer! Turn Power Pad on left shoulder to open the chest &amp; reveal Batman's headquarters and the hidden elevator. Shipping is free! *Prices can change at anytime!